If you’re in Sweden and there’s one word you should know, it would be ‘lagom’, a word that defines the essence of everything that is Swedish. More than two months into Stockholm and I must say it’s been pretty lagom so far. The city itself is beautiful, with the only downside being that everything is at least twice as expensive as in Lisbon. Maybe that’s what you get for everything around here being so perfect and systematic. And unlike Lisbon, you actually have easy access to a *large* collection of beers, which is definitely a plus. It’s autumn here right now, and the scenery outside is fabulous. Sadly though, the weather in Sweden is not-so-lagom. Temperatures are already hovering around 5 degrees celsius, and for an Indian like me, this is pretty cold in itself (heck, it never gets lower than 20 in my town back home). The funny thing is, this weather is cute for the Swedes. Let’s see how winter ends up looking like. Meanwhile, here are some pictures I took from Stockholm over the last two months. 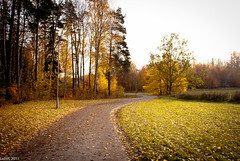 This entry was posted in Life, Non-Tech and tagged lagom, stockholm on October 31, 2011 by lalithsuresh. It’s a lot more beautiful seeing it, couldn’t do justice to it with the pictures!